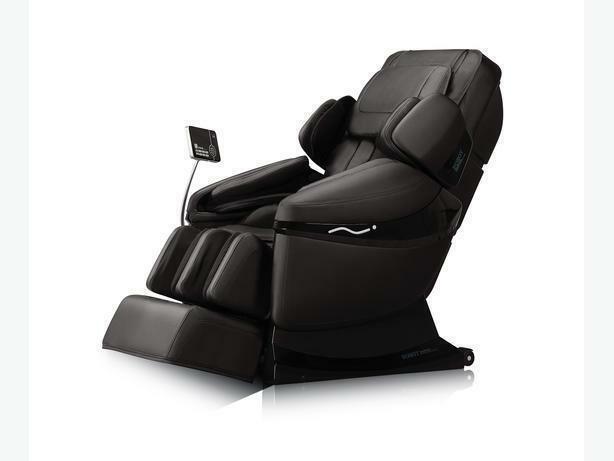 Our newest and most incredible massage chair ever, we gained exclusive rights to this model for all of Canada and this chair has retailed up to $8,000.00 in stores. It is as good as and better then chairs retailing up to and over $10,000.00. Our G series comes with an incredible under foot, heel & toes roller massage, even an airbag above the toes to enhance the roller massage. Above the heel massage, leg extension. Seat, hip, shoulder, bicep, forearm, hand/fingers and both sides of the back air massage. Incredible 3D massage that is both vertical and horizontal massage, back, calf/knee heat therapy. An incredible waist stretch function where your shoulders and legs are held, the chair then auto reclines to stretch your waist and lower back. Incredible feature for sure, there is also a back stretch and waist twist feature. There is also an incredible base of head, side of neck and top of shoulders massage that is incredible and unique to most chairs out there. We did the Home and Garden show and this was a huge hit, we beat out Panasonic and others at the show with quality & variety of massage and prices direct by far. Even people already owning very expensive chairs tried our G series chair, they said their chair could not do all the G series could do or do them as well. Built in speakers for your MP3, phone, iPhone, iPod, iPad or other gadgets. This allows you to listen to music or watch movies on your electronic devices, this chair is for anyone who wants it all and the best of all. For all other info and to check out the chair manual and our other products please visit our website showing on the ad. We also offer an extended warranty that covers you for 5 years on all electronics of the chair and for life at cost after the 5 years. You also get cosmetic coverage for life from the day you buy the chair.